Product information "Strip Door/Window Sensor"
The STRIP Door/Window Sensor is an extremely thin contact strip that is attached to the window or door frame to monitor the condition (open/closed) and transmit it to the Smart Home Control Center. The Strip Door/Window Sensor is designed for indoor and outdoor use, so you can also secure garages and garden gates. The Strip consists of two parts: a thin strip attached to the window or door frame and a short metal plate located on the moving part of the window or door. The Strip Door/Window Sensor is 19.5 cm long and only 3 mm thin. Due to its design, the Strip can be mounted almost invisibly on the window or door frame, unlike many competitive products. All you have to do is install the Strip to the desired location with the adhesive strips and connect to a Z-Wave Gateway. Thereafter, a magnetic sensor detects whether a window or door is open or closed and reports this to the Smart Home Control Center: no need to drill or lay cables. 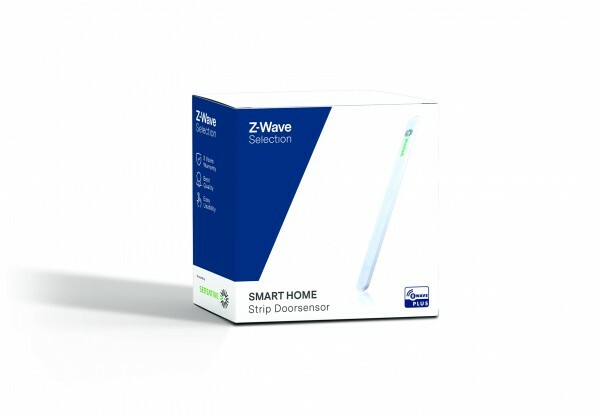 The Strip Door/Window Sensor is Z-Wave Plus certified and has a built-in battery with at least 10 years running time - this allows a maintenance-free operation and speaks for very low energy consumption. And when the battery is actually empty, the charge level is transmitted to the gateway. Please note that the sensor for metal doors and windows is not optimally suitable as they can shield the radio signals. A virtually invisible door/window sensor that can be used indoors and outdoors for a wide range of applications and always reports via the control panel whether an element is open or closed. Easy to install, low-maintenance and energy-efficient - ideal for burglary or weather protection. Related links to "Strip Door/Window Sensor"